Pronk into Spring with Alpaca! Alpaca isn't just for cold weather. Enjoy these useful and fun alpaca items this Spring and Summer! Alpacas are as curious about us as we are about them. 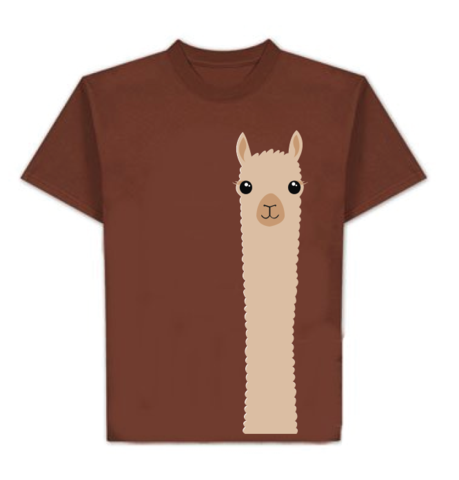 With this shirt you can share alpaca curiosity and fun everywhere you go. Sure to get looks and start conversations wherever seen. 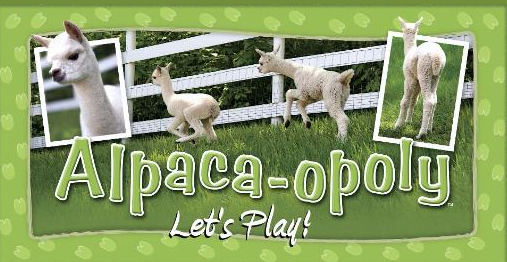 ALPACA-OPOLY is a customized "property trading" game that allows players to immerse themselves in the wonderful world of alpacas. If you like Monopoly, you'll LOVE Alpaca-opoly! 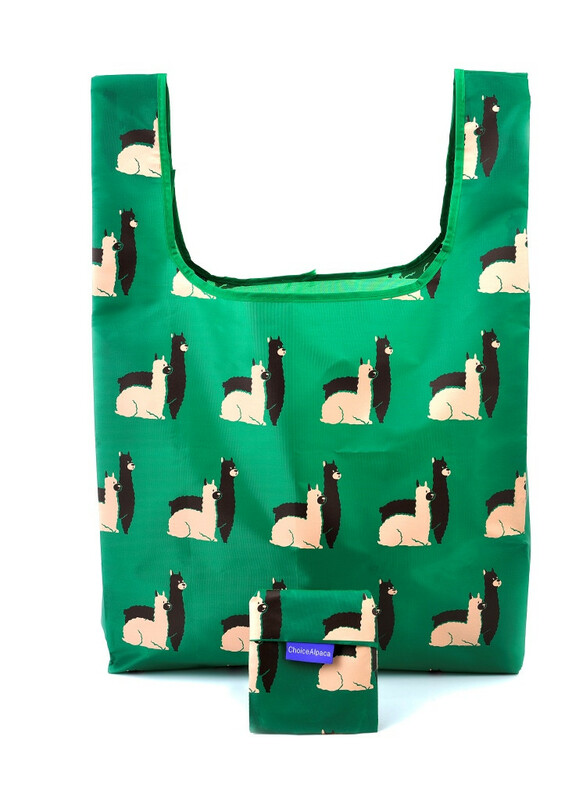 Show off your Alpaca Adoration with this fun and functional bag! 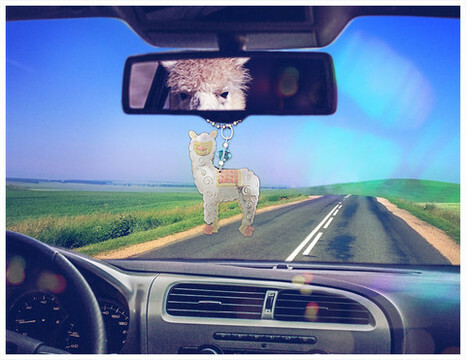 With oodles of charm, our Whimsical Alpaca Car Charm brings the power of Alpaca Love to your car! 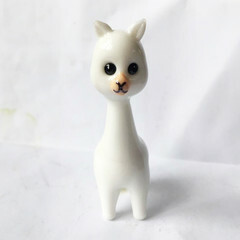 Murano Glass Style Alpaca Figurine. Designed with the help of our customers who helped decide the best of many designs, this cute alpaca figurine makes a great gift for the Alpaca Lover in your life. 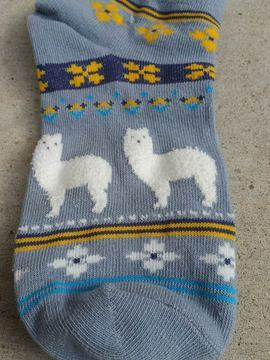 Show you Love of alpaca with these cute socks! Available in multiple colors in no-show or ankle height. 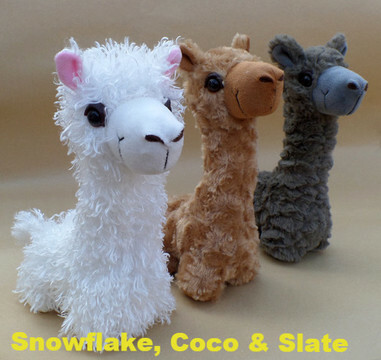 This cute little herd makes the perfect alpaca lover gift. Take one to the office to keep you company. Of course alpacas do not like to be alone so you might want to get a complete set! Well they are when they are delicious cookies cut with this custom Alpaca Cookie Cutter! A great gift, it makes our favorite farm animal as a tasty cookie! Attention Bird Watchers! What fun! Looking for something special for your winged friends that visit your back yard every year? Give them something special this year for building a cozy nest. The Alpaca Fleece-filled Bird Nesting Balls® are handcrafted by an American Alpaca Farm. Measuring 4" in diameter, they are made using natural-finished grapevine filled with at least three colors of 100 % USA alpaca fiber. Each ball provides nesting material for wild birds and hangs from a jute rope. It's no secret of a fondness for Alpacas with a collection of beautiful alpaca themed cards! Share the love of these magical creatures with your dear ones. High quality photo paper print on recycled paper note card w/ matching envelope included. Alpaca is also great for sports! These light weight alpaca trail and running socks from Dahlgren footwear are light and airy, wicking mosture from your feet so you can enjoy your best run. What could be more fun than a ALPACA BBQ?! NO!, not OF alpacas but a BBQ BY alpacas! This funny Alpaca apron is quality made and features two alpacas enjoying a summer day with a friendly BBQ of "Greenburger" brand burgers and a mug of "Sweet Grass Beer". Fire up the grill and enjoy the outdoors in this fun and functional quality made apron, designed for alpaca lovers and lesser humans with a fun sense of humor. 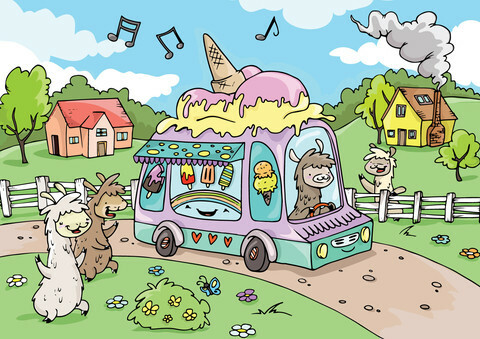 Enjoy a summer ice cream, alpaca style! This cute childs jigsaw alpaca puzzle is bright, fun and easy for new puzzle lovers. We have Stockings for their Stockings! Stuff their Stocking with Alpaca Stockings. Superwarm Alpaca Socks are sure to keep them toasty warm this winter. OutdoorAdventure Alpaca Socks are quickly becoming the most popular alpaca sock! Made with the same yarn as our Superwarm Alpaca Socks they are made to fit in a regular boot or shoe. We have socks and more socks for their Stockings this year! We even have the Stockings for their Stockings! Warming their toes and it will warm your heart! Stay Warm, Wear Alpaca! Be Happy! Did you know: While similar to sheep's wool, alpaca is warmer, not prickly, and has no lanolin, which makes it hypoallergenic and comfortable to wear. Here are our TOP TEN Alpaca Products to help you stay warm this winter! "What are the warmest socks ever?" "What are the best socks for cold feet?" "Where can I find extra warm socks?" "What are the warmest socks for extreme cold?" 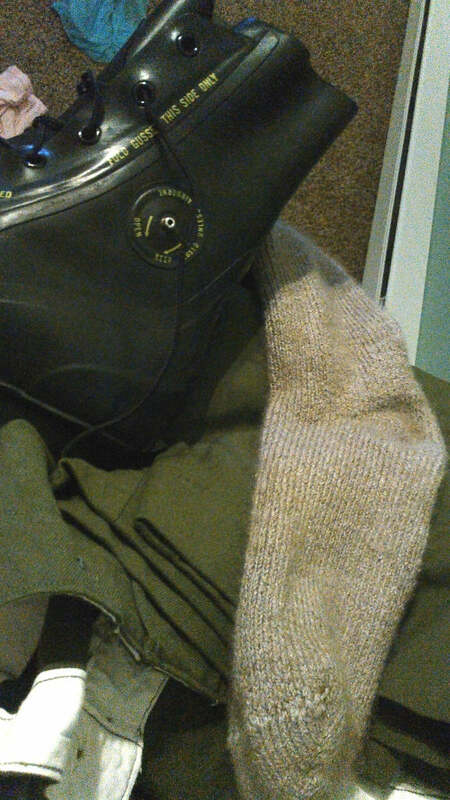 The Superwarm Alpaca Socks are it! Our most popular winter product! 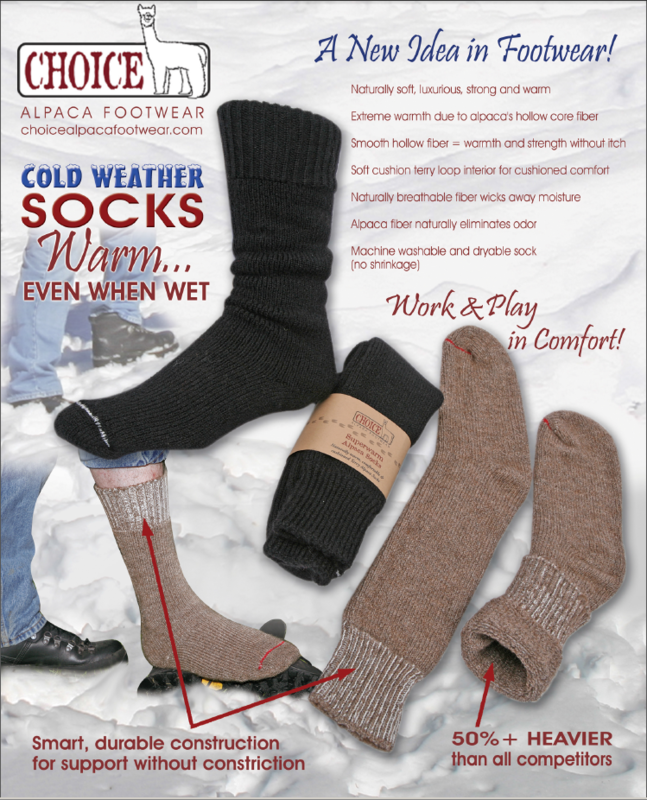 The OutdoorAdventure alpaca socks are the ultimate in comfortable alpaca warmth for the feet! Designed to be the warm, comfortable heavy alpaca socks ready for action! Available in multiple colors this unisex Solid Weave Brushed alpaca scarf offers a soothingly warm brushed baby alpaca surface in a classic alpaca scarf style which works with nearly any outfit! Cuddle up under our wonderfully warm and beautiful brushed alpaca bed blankets. A simple, functional item, put this blanket between the top sheet and comforter and enjoy a great increase in warmth! Very Popular Alpaca Hiking Socks! These field socks have a great look, feel and performance which has been proven over many years to be very popular and a best seller. Comes in classic hiking style. Look great in hiking shoes or birkies. The medium weight and good fit makes for a nice stylish hike through the Andes or your back yard. Once considered for the old salt, these unisex Classic Knit Fishermans Alpaca Hats are quite in again. Classic style of heathered color, with alpaca elegance, comfort and warmth. Knit alpaca chullos ("Choy-ohs") with ear flaps are great for staying warm and looking cool. Great on the slopes, a perfect ski hat or snowboarding hat. Stylish South American design. Each of these alpaca hats has a unique, varied patterns. These are what get you through winter. Farm tested, farm tough! Made of 100% soft prime alpaca fiber which has hollow-core insulation factor; everyone who works outdoors will LOVE these products! Natural colors, undyed. They have a particularly strong following among hunters, fisherman and farmers of all types. Some have reported wearing them as a liner INSIDE another glove for an extreme warmth combination, smart! This natural alpaca fiber shoe insert grown and crafted in the USA will keep you WARM - from the bottom up! Works well in outdoor boots, indoor shoes and even slippers! Alpaca shoe inserts wick away moisture, saving your shoes and your feet! What are your favorite winter socks? Are your feet COLD right now? Brrrrr! They don't have to be, with this natural alpaca fiber shoe insert grown and crafted in the USA. They will keep you WARM - from the bottom up!. PurelyAlpaca is currently supporting American Farmers with our Made in America Alpaca Shoe Inserts. Paula say, "Oh my, these are great in my slippers! I didn't expect them to feel sooo soft, warm and cushiony!". Gene adds, "Hey, these feel great in my outdoor boots." Give up the cold and step onto warm comfortable Alpaca with these made in the USA alpaca foot warmers! Great for outdoors in boots! An extra soft and warm cushion in your slippers! These alpaca insoles are thick, soft and provide a warm barrier between you and the cold below. For extra warmth try Made in America Superwarm Alpaca Socks! But don't fret, winters annual migration to our feet has found its match in the Superwarm Heavy Extreme Alpaca Socks from Choice Alpaca Products. If you are serious about having warm feet through the cold winter months, the Superwarm Alpaca Socks are your answer. Heavier and warmer than all other socks out there, these socks have proven their value 1000s of times since their inception in 2006. Not only are alpaca socks warmer than any other sock, they're COMFORTABLE, DURABLE and WASHABLE. Superwarm Alpaca Socks Fan Mail Makes us Smile! We love our alpaca socks, but we really love to hear how you love our alpaca socks! "While still living in Arizona, I went back to Northeastern Wisconsin every year for deer hunting. It involves being out in stand from dark to dawn. It is usually snowing with a bitter cold wind coming from the great lakes. I ordered the Superwarm Alpaca Socks was because the farmers almanac was calling for an especially brutal hunting season. And they were right! Almost all the equipment I use is military surplus except my blaze orange jacket and hat. Well my feet have been getting cold the last few years. After reading that weather outlook I decided to do something about it. After doing some research I came to the conclusion that your "Superwarm Alpaca Socks" were the warmest. I wanted a warm, good quality sock, to last last me for years. When I left Tucson airport a few days before season it was 83 degrees and sunny. The second day of deer season it was -18 degrees with the wind chill! That is over a 100 degree change in temperature in a few short days. I cant say I stayed warm. I can say my feet stayed warm! I wear heavy wool pants and shirts. Normally I wear heavy duty wool socks. But now I wont wear anything but your alpaca socks while hunting. I have recently moved to one of the coldest parts of the continental United States. Last year it reached almost -60 below. All that means for me is I am ordering another pair of socks tonight before the snow starts flying here I'll be at a hunting camp near the Canadian border in Minnesota. The cabin is only lit with oil lamps and we don't have electricity. I'm ordering another pair of your socks right away." - Ryan K.
Stay warm for sure, Wear alpaca! Love our Superwarm Alpaca Socks? You could get a pair FREE! Send us your story a great pic (that we can use) of you using our Superwarm Alpaca Socks. If we love it we'll send you another pair, Free! Do you have an active, popular website? Help us promote alpaca while at the same time earning some money with the PurelyAlpaca Affiliate Program. What is an affiliate program and how does it work? You "automagically" earn a commission! We handle all the details of getting and fulfilling the customer's order. All you need to focus on is promoting alpaca and the www.PurelyAlpaca.com website!